Engaging activities like an easy-grasp teether, crinkly fabrics, and other soft textures soothe baby. Featuring Albertina, a sweetly lovable beaver named after the famous scientist Albert Einstein. One of Tiny Love's Tiny Pioneers - encouraging babies to explore and learn. Use the ring to hang the take-along toy on your baby’s infant seat, stroller, or crib for on-the-go and indoor engagement and fun. The clearly defined face, bright colors, squeaky sounds and textures stimulate baby's senses and support development. 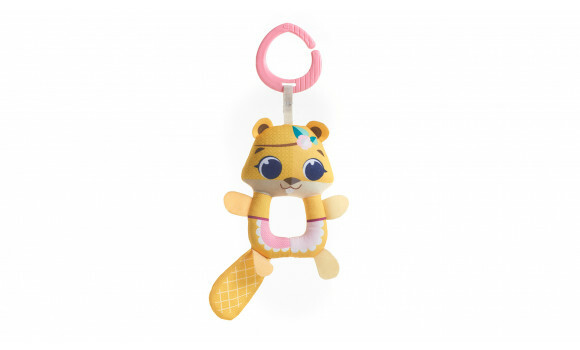 Small enough to take anywhere, Albertina Squeaker stimulates your baby to use fingers and hands in a variety of ways, thereby helping your little one develop fine motor skills.